It cannot be denied that Khasekhemwy and Netjerykhet were outstanding kings during whose reigns the Egyptian State definitively came out of its long formative phase to enter the maturity which would produce majestic achievements in administration, technology, architecture, 'arts'. Yet the scarcity of monuments from the reigns of their followers undoubtedly reveals some kind of contraction if not a crisis, despite arguably one of a different character than that afflicting the middle part of the Second Dynasty. Without Djoser's reign's archaeological evidence, the Third Dynasty would have been quite a historical vacuum. 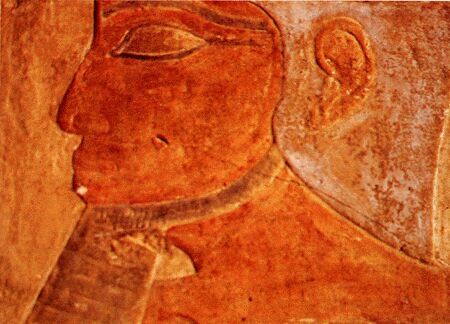 Djoser is one of the most important (and 'renowned') king of the Old Kingdom and of the whole history of Egypt. There are many important high dignitaries known from this reign by inscriptions in North Saqqara as well as in Upper Egypt [cf. 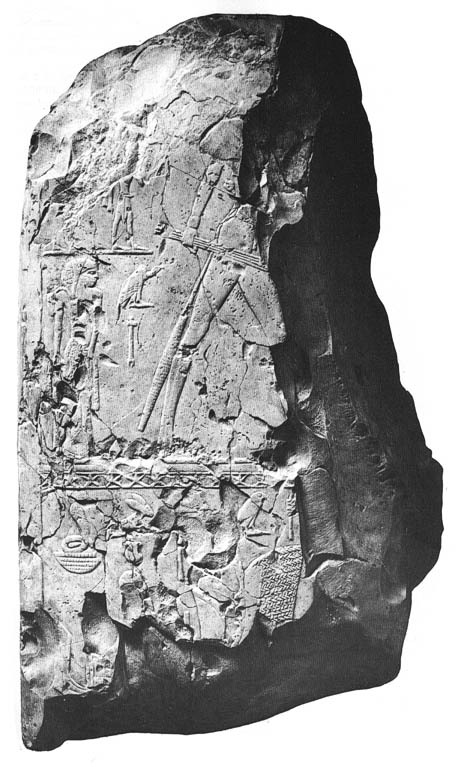 Helck, Thinitenzeit, 1987]; various private statues are attributed to his reign by style or epigraphic comparisons (Vandier, Manuel I; Weill, IIe et IIIe dynasties). The fact that Imhotep lived during Djoser's reign (and possibly also during Sekhemekhet's one) made both the king and (especially) his chancellor/architect the earliest individuals to have been object of worship in the later history of Egypt (see Wildung, Die Rolle, 1967; id., Imhotep und Amenhotep; Baud, Djéser et la IIIe dynastie, 2002, chapt. 3). In Late Period, Imhotep was deified and several bronze figurines and inscriptions have been found dedicated to him, particularly at North Saqqara. His lord, Djoser, must have enjoyed an outstanding favor in the cult as well, as attested by later 'portraits' of his (Tanis ?, see below; Saqqara, Bronze plaque relief of Amon, JEA 53, 1967, pl. 26.4 -suggested by H.S. Smith to resemble Djoser's reliefs-; Saqqara, Dyn. 30 ? statue BM EA941, Baines-Riggs, in: JEA 87, 2001, 103-118, strictly inspired to the Serdab Statue of Djoser Cairo JdE 49158; Netjerykhet's serekh on the base of a statuette of Ptah from Saqqara, ibid., pl. XV, 2-3). 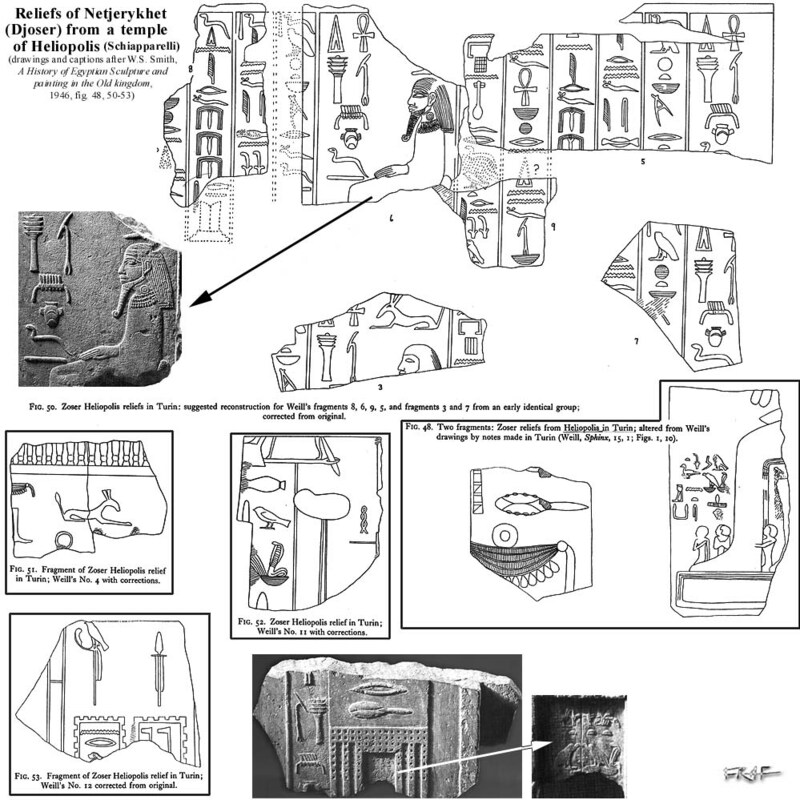 We may even add the NK hieratic inscriptions of the SPC, the traditions preserved on papyri (Westacar), the copy grids left on two of the six panels of the Step Pyramid Complex galleries, the Sehel stela and many more clues showing the depth of the historical and cultural mark this sovereign impressed on the minds of the Egyptians, the persistence of his name in their memory. Indeed the relevancy, the favour and the cult acknowledged in later periods must have depended, certainly for a good part, not only on the outstanding role that Djoser and Imhotep had by their time but mostly on the magnificence of the Saqqara Complex: it was a commonly visited monument through the ages (NK hieratic graffiti, cf. Step Pyramid 77ff.) 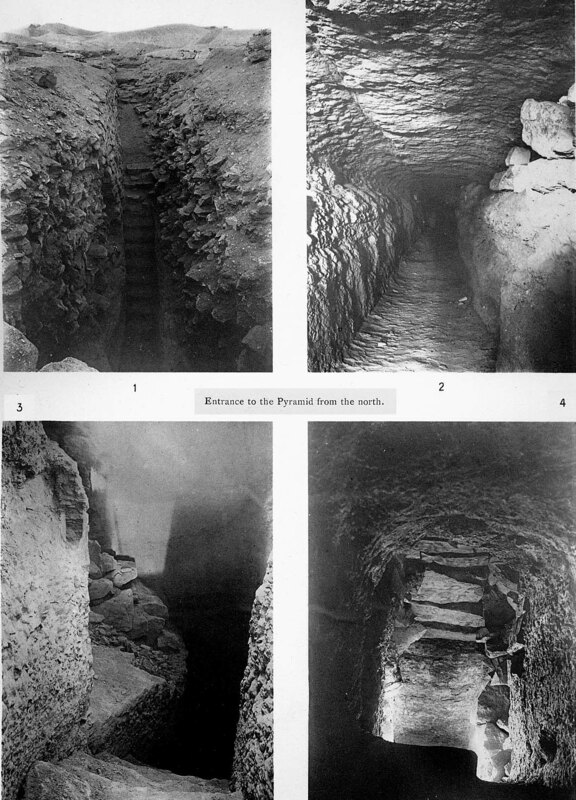 and the 26th Dynasty pharaohs realized the excavation of the pillared gallery which connects the southern court to the shaft which opens underneath the Step Pyramid base (see the photographs at the bottom of this page) down to the burial bunker-like chamber. As we have stated about Sanakht-Nebka, it is still difficult to understand whether Netjerykhet was the beginner of this dynasty or the second king. The first hypothesis has been recently preferred but some doubts still remain. 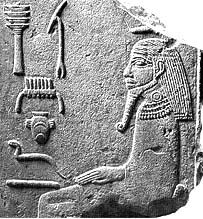 I am convinced that Netjerykhet was Khasekhemwy and Nimaathapy's son, but I also think that a reign by a brother (?) of his could have preceeded his own one. I admit that: 1) the proofs for this statement are not direct ones, but derive from the difficulty to place Sanakht elsewhere (cf. August 2007 Update in Sanakht's page); 2) there do exist proofs of the contrary hypothesis, namely the presence of seal impressions of Netjeryhet in Khasekhemwy's tomb (V) and funerary enclosure (Shunet ez Zebib) at Abydos; but as we have seen (Sanakht) the apparent direct succession Qaa-Hotepsekhemwy that the latter's seal impressions in the former's tomb should prove, did not happen in reality (2 or 3 ephemeral kings likely reigned after Horus Qa'a's demise). [Note: the seal impression Wilkinson (E.D.E. 1999, 95) mentions as found in Khasekhemwy's Abydos tomb V only shows the sign 'ntr' which could also be reconstructed as Ninetjer 's horus name (Kahl 1994, Quellen 2099); certainly of Netjerykhet's reign is instead the specimen recently found by the German mission (MDAIK 54, pl. 15 b)]. The biggest problem is just the consistence of Sanakht's reign: it would surely fit much better before Djoser or perhaps soon after him if we knew that Sanakht reigned few years; archaeological evidence is not very impressive: no tomb or funerary complex has been found and the only massive architecture datable to him is at Beit Khallaf. So I conclude that the Turin Papyrus amount of 19 years is likely a mistake (the same number is also provided for his follower Djoser) and Djoser was effectively either preceeded or directly followed by Sanakht, who reigned only 3-4 years at most. [NdF: the thesis that Sanakht reigned after Sekhemkhet or even after Khaba, although recently embraced by some scholars, is in my opinion far less probable, as explained in Sanakht's page]. 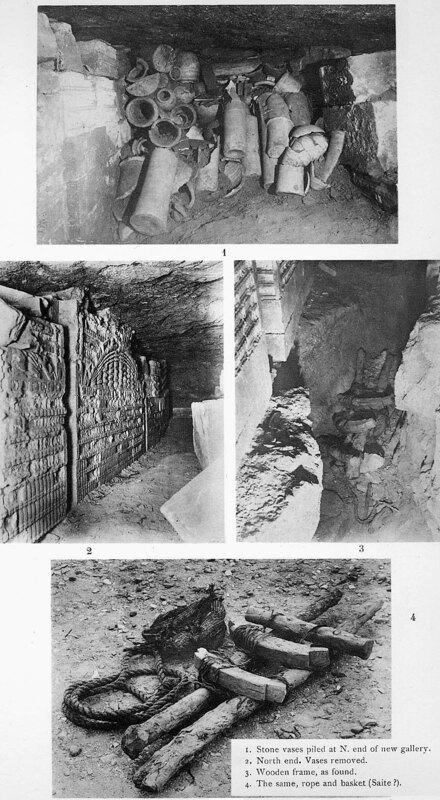 The King and his dignitaries were the prime mover of such an evident development, clearly manifest in the higher degree of architectural complexity and in the deeper and more differentiated symbolic value of the constitutive and decorative elements of the Saqqara funerary royal/private apparatus. The technical-organizative skill of individuals as Imhotep and Hesyra, who both lived during Netjerykhet's reign, opened up the doors to prestigious careers for these officials who deserved leadership charges at the vertex of the bureaucracy and administrative apparatus. Nobles always had easier access to the highest charges, but it is possible that there was some more "meritocracy" in the state subsystems than later in the Old Kingdom. 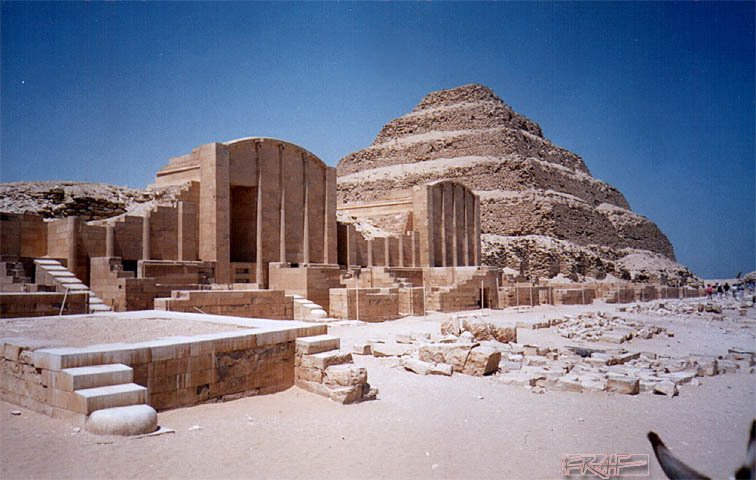 I don't intend to extensively describe Djoser Step Pyramid complex at Saqqara. It suffices to remark few points: in primis the importance of the excavations that, since 1920s, involved Firth, Quibell, Lauer after that briefer explorations had been lead by Segato, Perring, Brugsch and Lepsius in the century before. 1) Noteworthy is the recognization of a whole serie of architectural elements with a strong symbolic-evocative value (now reerected within the enclosure wall perimeter); they are the first attempt of a transposition to the stone masonry of archaic shrines that had been built, since then, in perishable materials (and so lost for us). The monument is a huge funerary offering to the deceased king, granting for him the eternal repetition of his Jubilee feast (Heb Sed) by virtue of the magic which representations possessed in the ancient egyptians' belief. The importance is also in that, within circa half a century, royal funerary complexes underwent a complete transformation after which new shapes substituted the archaic ones and these latter persisted only in altered or re-elaborated versions, often quite distinct from their original models. It's an archaicizing style based on models that were probably already ancient at that time, some traces of which can be found on Thinite labels, in certain Pyramid Texts hieroglyphs and passages, or in Late Predynastic carvings and other representations. As we' ll see, no other royal complex is likely to have been ultimated in this phase until the one in Meidum (whose traces are almost completely lost except for the pyramid). 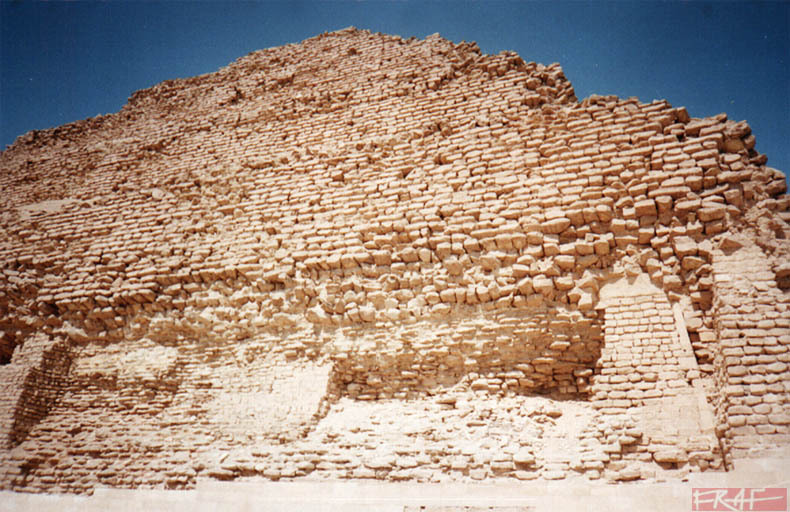 The enclosure wall with "palace façade" course, already adopted in the Abydos and Hierakonpolis 'Talbezirke' (formerly called Forts) and on the external side of the Abydos (I-II dyn) and Saqqara (I - III dyn.) Mastaba tombs, will survive after this age solely in the paintings of MK coffin decorations. Even being each Pharaoh's funerary complex a 'unicum' in itself, the one of Djoser is still more unique, owing to the absence of further similar monuments either preserved or finished (cfr. sub Sekhemhet too). The different stages in the Step Pyramid construction starting from a mastaba and then achieving a 4 steps and finally a 6 steps pyramid, the intricate nature of its underground galleries, indicate that the project was the first attempt in this kind of architecture; it covered previously built tombs (as the 11 eastern pits under the pyramid east side and the scarcely known storerooms corridors on the west side of the complex ) of the II and early III rd Dynasties. The two later III rd dyn. funerary complexes of Sekhemhet and Khaba are, in their evident simplicity, architectures of a more oredered and meditated design, reflecting a project which was established and fixed from the beginning of the works, not one that proceeded with addictions and modifications over time. Under this aspect Djoser complex was, alike the ones of Snofru and Khufu, a major break in the tradition and a search (need?) for novely, albeit its roots were unavoidably connected to the antecedents of monumental religious architecture and ideological foundations of the past. We can only speculate about the motives that led to similar kind of developments, probably a reflection of rapid evolutions in the religious, political and economic spheres supported by parallel achievements in technology. In conclusion we rehearse the concept that the Step Pyramid Complex, so aboundant in symbolism from the past tradition as well as in new elements, witnesses with its magnificence the high degree of state organization achieved and the "overdisplay of power" through conspicuous consumption of means and materials that the King could manage; by its multiplied symbols and evocative shapes it in turn echoes the deeper and more etherogeneous ideology which was progressing towards the establishment of the traditional Pharaonic culture in Egypt. 2) As far as inscriptional material, the underground chambers and galleries have yielded tens of thousands of vessels, but their importance is almost entirely limited to the study of the immediately previous period (i.e. Dynasty I-II); no example is known with royal names inscriptions of Nebka/Sanakht or Netheryhet/Djoser (cfr. Helck in Z.A.S. 106; Kahl 1994; Lacau-Lauer Pyr.Deg. IV(1959), V(1965)). 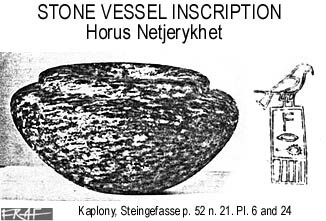 Actually there is only one bowl bearing the serekh of Horus Netjerykhet (see fig. >). 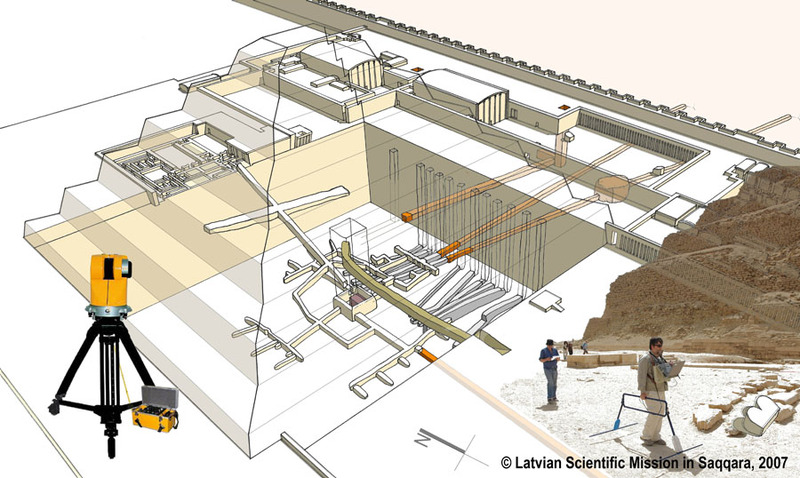 We must remind, on this subject, that the whole area of galleries under the western side of the complex has been only superficially explored (it is dangerous and falling); more than 400 meters of comb-like stores yet perhaps not surprising in architectural structure could instead be source of many more archaeological finds; the sector might in fact have covered (Stadelmann's theory) Second Dynasty mastaba substructures similar to the royal ones built south of the southern themenos wall. Another area which could produce satisfactory results is that in between the funerary temple and the northern wall; it's yet uncleared but various sparse surface findings have been carried out there and the western area of the northern court lies, like the western massif, over underground galleries of possible earlier date (these ones have been proposed as substructures of royal tombs of obscure kings like Wng, Send, or of Khasekhemwy: cf. R. Stadelmann, in: BdE 97/2, 1985, 295-307; A. Dodson, KMT 7:2, 1996,19-31; id., ZAS 115, 1988, 133). The underground galleries and funerary chamber under the pyramid, as well as the South tomb, have never been open to the tourists flows for their stability conditions have always prevented that. The 1992 earthquake has brought even more deterioration, and further large faults have appeared (as it has occurred with the Serapeum); questions do arise about the urge to remove parts of the decorations which could be lost in case of a ceiling collapse; it has been called for the need of a seismic analysis of faults and other damages originated by the quakes (Johnson, in: JARCE 36, 135-47). 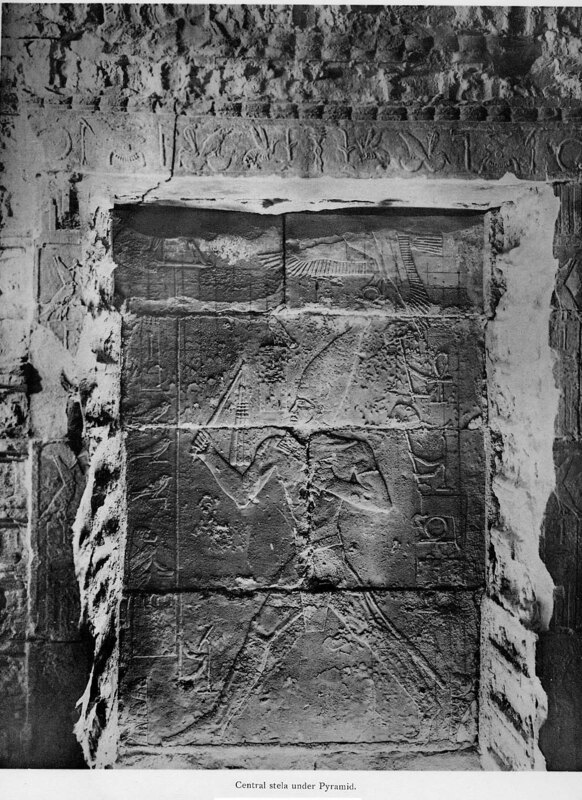 3) Reliefs; the well known panels in the niches of the underground galleries (of both the pyramid and the 'south tomb') show the king celebrating royal rituals surrounded by geographic and magic symbols and hieroglyphs not seldom of obscure meaning (see F.D. Friedman, in: JARCE 32, 1995, 1-42). These carvings have a fully new and sharper style and spatial organization, prefiguring the graphic style of the hieroglyphic texts layouts in the IV th and V th dyn. tombs (cf. the three figures at the bottom end of this page). The inscriptions start to be enclosed by rows or columns and, even without divisory lines, the writings are now ordered and well set into their own spaces, and better balanced in their relationship with the images. Less evident is the progress in the statuary; either the private or the royal one, still shows the favour for a set of canons belonging to the past epoch: the archaic Khendw seat; facial features more accurately defined than the rest of the rawly made body (cf. the excessive squatness in the features of IInd dynasty statuettes, the preminent head on proportionally smaller shoulders, with the exception of Khasekhem's statues). Djoser Serdab statue (Cairo Museum, JdE 49159; photo courtesy Jon Bodsworth) and a couple of later red granite heads (HUNI ?) are the only examples of IIIrd dyn. royal statuary; there are indeed various fragments from the Step pyramid complex like bases (Cairo Museum n. 6009) or other parts of human statues (Sourouzian, 1998); the same site produced some fragments of statue bases decorated with joined prisoners' heads (6050) and fragments of at least one monumental alabaster statue (the colossal size is comparable to that of Menkaura in Boston and Userkaf in Cairo) from one of the chapels (P) in front of the Heb Sed court. Other reliefs of Djoser have been found at Horbeit (Shednu, the Lower Eg. 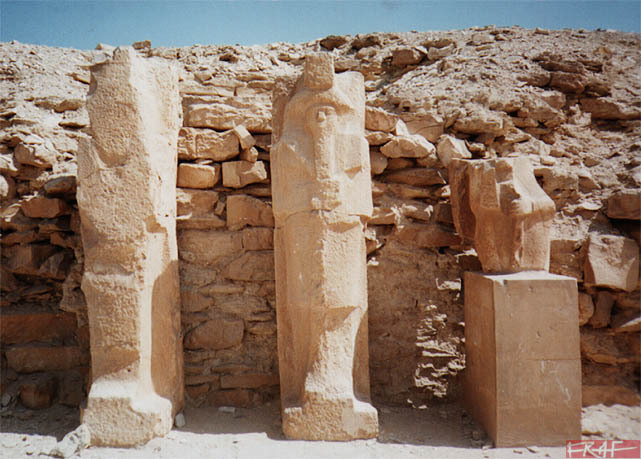 XI th nome capital); until recently they were thought of Third Dynasty manufacture, but now they are recognized as Saite copies of Djoser's monuments. From the ruins of a (naiskos) temple at Heliopolis E. Schiapparelli brought back into the Turin Museum, in 1904, about 40 fragments of inscribed white limestone of various size; two women names appear on them: Intkaes and Hotephernebty plus a third one. They are at the feet of the sitting king and rendered in a much smaller scale than the king; they bear the titles of 'King's daughter' (Sat Nswt) and 'King's wife' (Wrt Hts/ Maa Hrw) respectively. A second daughter's name (partly erased) has been read Njankh-Hathor by A.M. Roth (JARCE 30, 1993, 54). The name of the mother (?) NjmaatHapy never appears in these fragments in Turin, most of which (although of minor size) still await a proper publication. The pieces reproduced by R. Weill and W.S. Smith show the gods Geb, Seth, beautiful inscriptions in columns separated by lines (formally the spells are reminiscent of the Pyramid Texts assemblage but the text is completed by figurative representations) describing the performance of some rituals to be connected with the Heb Sed ceremony (W.S. Smith 1946, 133-9). 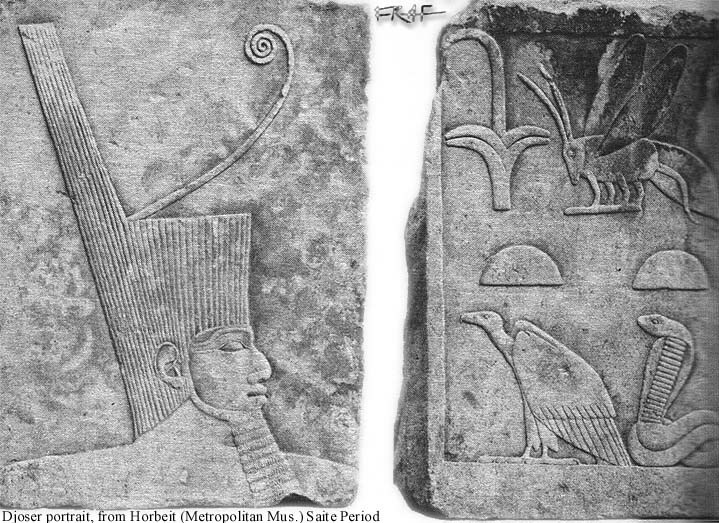 The slab from Horbeit is much similar to another "portrait" (of Djoser ?) from the reliefs found at Tanis (thanks to J.D. Degreef for image and references) [J. Goyon, La découverte des trésors de Tanis, Persea, 1987, 34]. 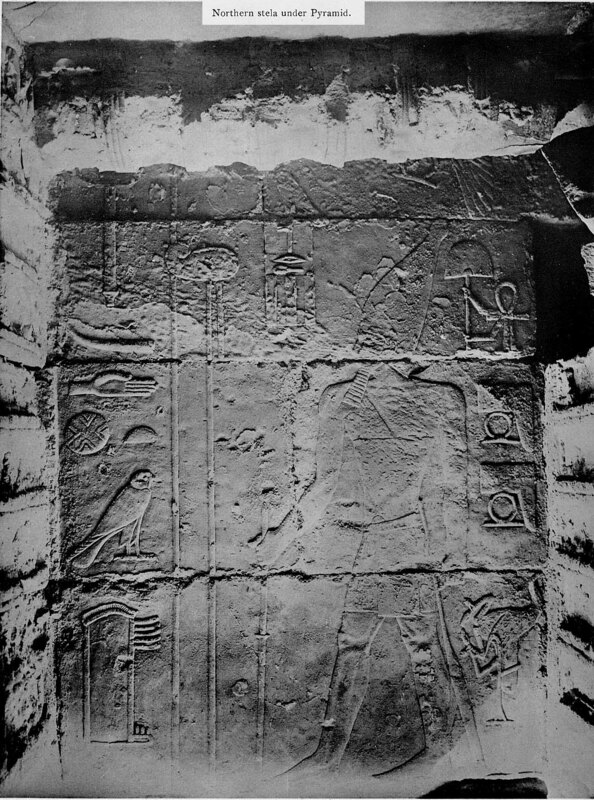 Many other stela fragments from the Step Pyramid south court and serdab court show the names of the two cited ladies, princess Intkaes and Queen Hetep-her-Nebty. (For the queens' titles in the age of Djoser : W. Helck 'Thinitenzeit' p.108, 119-21; L. Troy, Patterns of Queenship in Egyptian Myth and History, 1989; M. Aly, in: MDAIK 54, 224-6; M. Baud, Famille royale et pouvoir 1999). 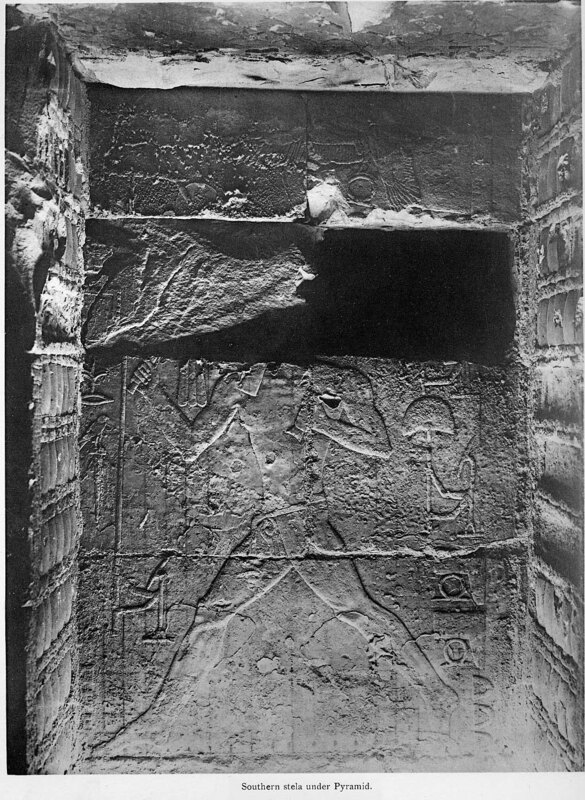 The tolemaic inscription (N. 81) found on the isle of Sehel is introduced by a representation of the pharaoh who praises the devine triad of Elephantine (for having given the Nile a regular flood after 7 years of famine) presenting the 'Dodecaschoinos' territory to the ancestors of the tolemaic priests of Khnum [Photo from ANSE website gallery]. The pharaoh is here named by both his major royal names: NETHERYHET and DJOSER; this document, albeit not an Old Kingdom one as it was meant to appear, was the source which finally demonstrated that these two names belonged to the same king. Earlier (New Kingdom) hieratic inscriptions in the SPC were already known to mention the name Djoser (Netjeryhet's birth-name? ); the earliest monument known reporting the name 'Djoser' (in cartouche) is the base of a statue of Sesostri II (Berlin 7702; cf. Wildung, Die Rolle, 1969, 59-60). I wonder if this name couldn't have been perhaps originated from a misinterpretation of the hieroglyph Dsr on the upper left portion of numerous boundary stelae from the Saqqara complex (in Inpw/Anubis' epithet Khenty Ta-Djeser, see fig. above). As we've said, this king is likely to have been the last of his dynasty under whose reign the necropolis of Bet Khallaf (mastabas K1, K3,K4,K5 this last perhaps of Nedjemankh; cfr. 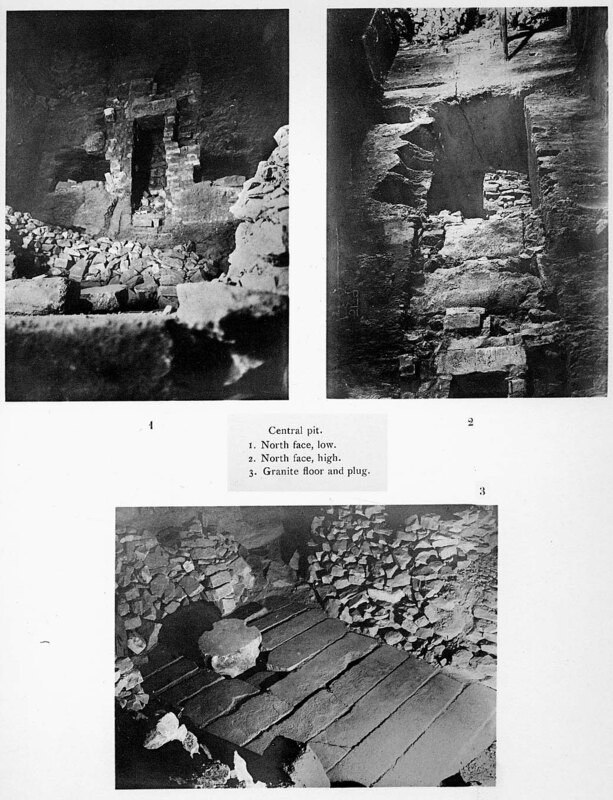 Garstang 1903 and 1904) was active (but note that the rather ephemeral reign of Sanakht could have also directly followed Djoser's one, as it has been pointed out above). If he was the foundator of the Dynasty, Netjerykhet would be the earliest king whose name was found on the Wadi Maghara reliefs (copper and turquoise mines), where Sekhemkhet, Sanakht and several later kings will also leave incriptions [Gardiner-Peet, 1952, pl. 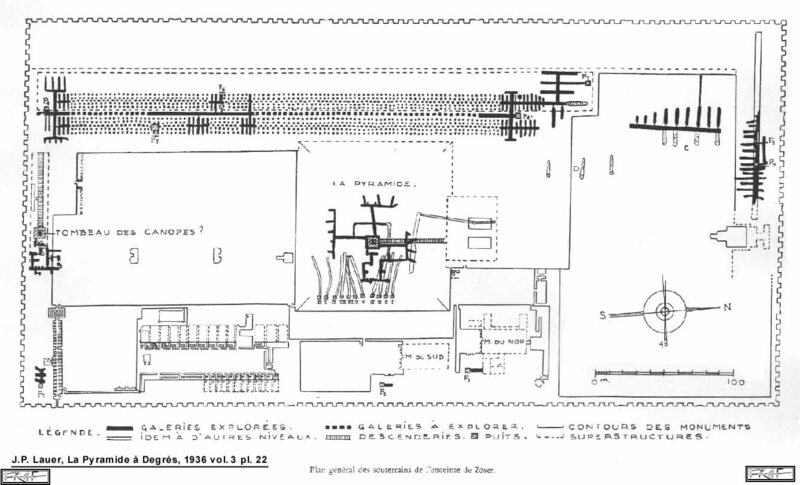 I.2; Weill, Recueils des Inscriptions ..., 1904, 99f. ; Kahl et al. 1995, 120f.]. Alike for Sanakht, it seems strange that the two sovereign, maybe brothers, to whom the Turin Papyrus attributes the same regnal duration (19 years), are archaeologically so detatched from each other. The precious Turin Canon reports two lacunary phrases in the row (column III, 5) naming Djoser; the red color for the writing "Nswt Bity" indicates that the original text from which the Royal papyrus was copied (under Ramses II) had this royal name heading a page, column or line. Year I - Appearance of the King of Upper Egypt , Appearance of the King of Lower Egypt; Union of the two lands; Race around the Enclosure Wall. Year II - Appearance of the King of Upper Egypt , Appearance of the King of Lower Egypt; Passing (ibs) of the Upper Egypt King by the two Snty (Snwty) pillars (or stelae). Year III - Followers of Horus ; Birth of (a statue) of Min. Year IV -Appearance of the King of Upper Egypt , Appearance of the King of Lower Egypt; Stretching the ropes for the Qbh Ntrw (foundation of the eastern enclosure). Year V - Shemsw Hor ; Dj.....(djet feast ?) (cfr. Helck - Thinitenzeit p. 167). Djoser's seal impressions have been found, apart from Beit Khallaf Mastabas K1(16), K2(1), K3(3), K4(1), K5(8), (also ink inscriptions have been found in these tombs, see Kahl et.al 1995), in the Shunet ez Zebib enclosure at Abydos, in the Wadi Maghara (1) in the Saqqara Mastabas of Mereri, in S3518 (1), S 2305 (1) and in S 2405 (1) the latter belonging to Hesyra) and even one in the Step Pyramid of Sekhemhet (Z. Goneim 1957 p. 10 fig. 26), at Hierakonpolis (Quibell-Green, cit., tav. 70,3 & IAF III, fig. 803) and Elephantine (MDAIK 43, 109, fig. 13c, t.15c; J.P. Pätznick, Die Siegelabrollungen ..., 2005). 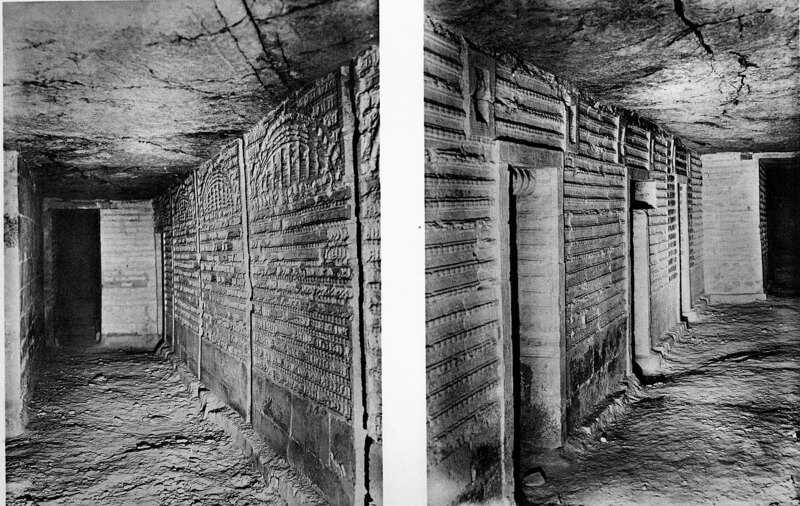 The Abydos examples, both from the Shunet ez Zebib and in Khasekhemwy tomb V at Umm el Qaab, could be seen as an archaeological proof of the continuity and direct succession of Khasekhemwy and Netjerykhet: the latter was the king who presided at his father's funerary ceremony (Wilkinson, E.D.E. 1999, 95). The plate fragment from Byblos with Neferseshemra name could be either of Khasekhemwy or of Djoser reign (cfr. Kemi 1). The Statue's inscriptions dated to Djoser's reign in Kahl et al. 1995 corpus of III rd dyn. are the two of Ankh (granite sitting statues Leiden D93 and Louvre A39, cfr. 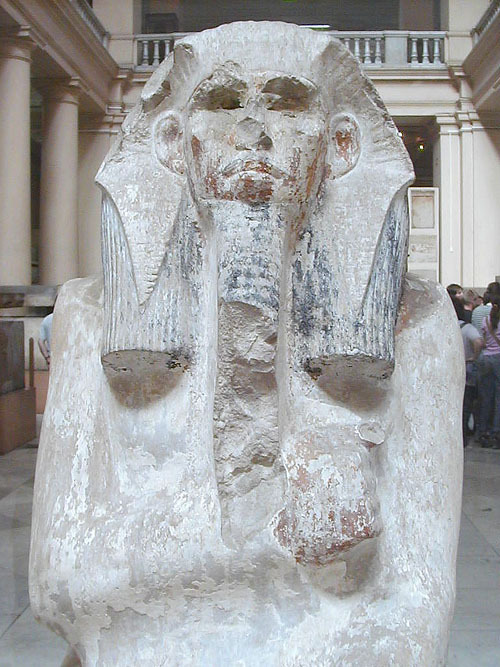 ASAE 31), of Sepa (limestone standing statues in the Louvre - A36 and A37) and the one of Aper/Ndjeswa (limestone, Louvre A38). (R. Weill 1908). The Turin Museum hosts an important limestone stela fragment from Gebelein datable to the late IInd Dynasty or early IIIrd: no royal name is preserved on it (cf. Khasekhemwy); although in a provincial style, the drawing line sharpness and the register subdivision recall the reliefs of Djoser (cfr. Wilkinson E.D.E. 1999, 302, fig. 8.7, n.3) more than those of Khasekhemwy (cfr. ibid., 1999, 178, fig. 5.3, n.4); indeed the variations in the pieces' rendering during the reign of Djoser are very wide (stylistic differences between the mentioned fragment from the Step Pyr. 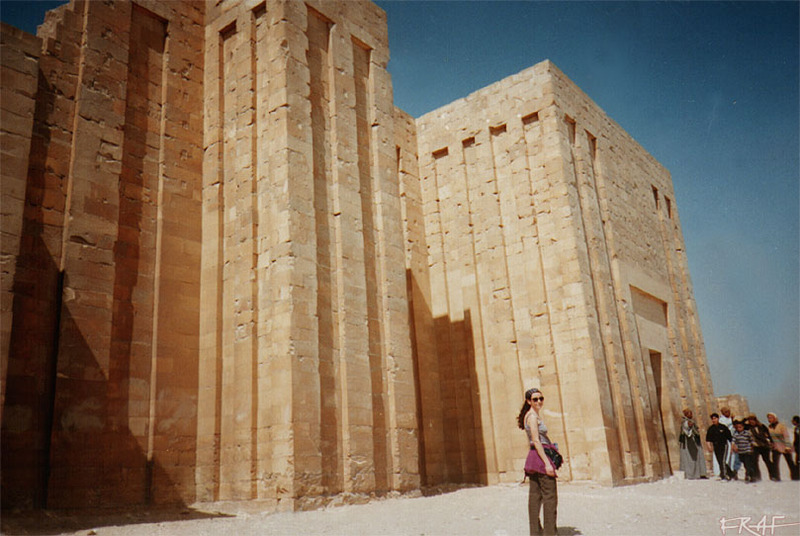 complex, the one from Gebelein early temple of Hathor, the Heliopolis reliefs and the Step Pyr. complex Heb Sed panels... This suggests, as it has been argued in relation to his building activities, a possibly even longer reign than the 19 years one credited by the Royal Canon (which also gives 19 years to Nebka). 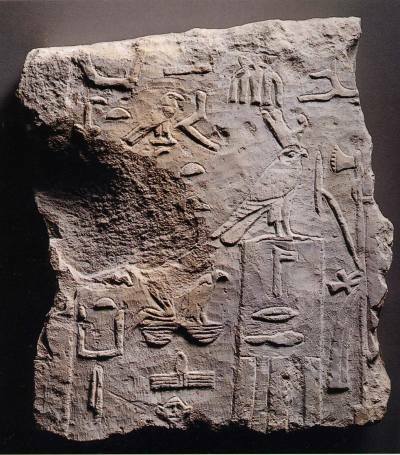 Some reliefs of Khasekhem/wy from the Hierakonpolis 'Fort' (cf. N. Alexanian, in N. Grimal ed. Les Criteres de datation stilistiques..., 1998) also seem to parallel the style of the Gebelein Turin and Cairo (cf. below) pieces. An unprovenanced relief in the Cairo Museum was also linked to the Gebelein one in Turin by its close similarity (W.S. Smith 'HESPOK, 137-8 pl. 30). I slightly favour the earlier datation to Khasekhemwy's reign than that to Djoser period. 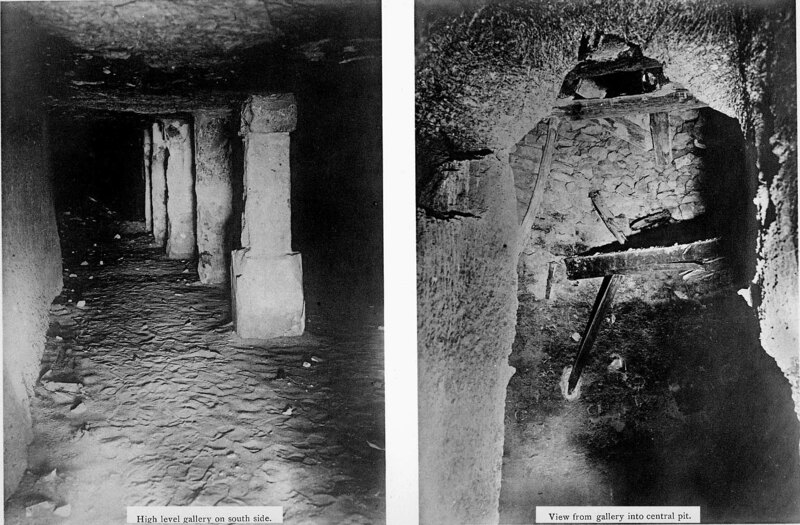 The 1930s explorations of Djoser's complex burial chamber provided remains of a skeleton: in a typical OK fashion it had been wrapped in linen and covered with plaster so to receive a body-moulding. Some recent radiocarbon dates seem to deny Old Kingdom origin of the remains, but this may be due to contamination of the remains; the possibility that these bones did belong to the corpse of Djoser-Netjeryhet is however near to zero (cf. Baud, 2002, 76); it also seems that the remains belonged to various individuals. 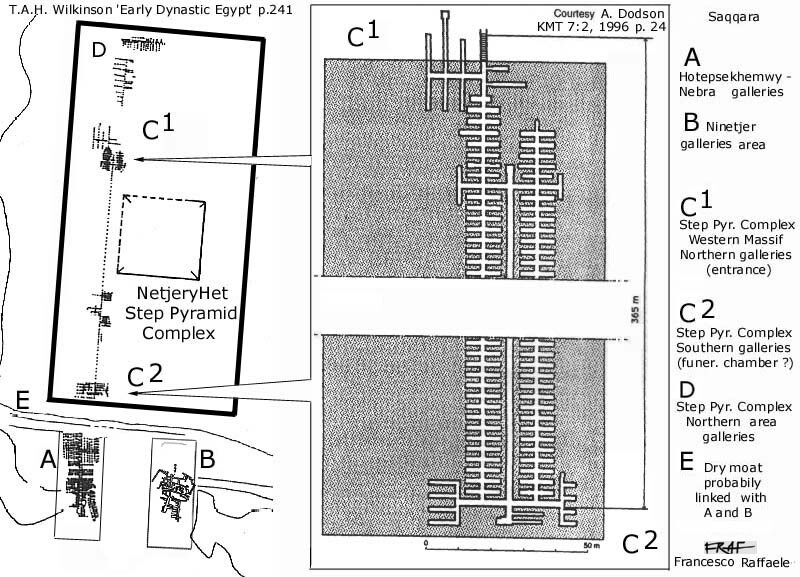 The burial chamber beneath the pyramid hasn't been fully cleared yet (A. Dodson in KMT 9:2, 1998 p. 27-40). Contemporary to Netjeryhet are the masterpieces from the mastaba of Hesyra (see -in italian- here); the carved wooden panels contain features that will be copied for millenia (cheek furrow beside the mouth) and, in the same corridor but on the opposite wall, very deteriorated paintings (only the lower part is but partially visible) depicting the necessary (work tools, games) for the dead; these representations are the first stage in the so called 'daily life scenes' which were going to become so common only few generations after that of the great Netjerykhet. Unluckily still missing is the tomb of one of the most celebrated and discussed non royal personages of the whole Egyptian history: notwithstanding Emery's excavations in NW sector of North Saqqara élite cemetery, more recent Polish discoveries in the stepped area west of the Complex western wall and two huge mastabas found (late 2007) by a Scottish team lead by I. Mathieson in the North Saqqara cemetery, Imhotep's tomb is still awaiting to come back to light. (Cf. Saqqara page and related bibliography). 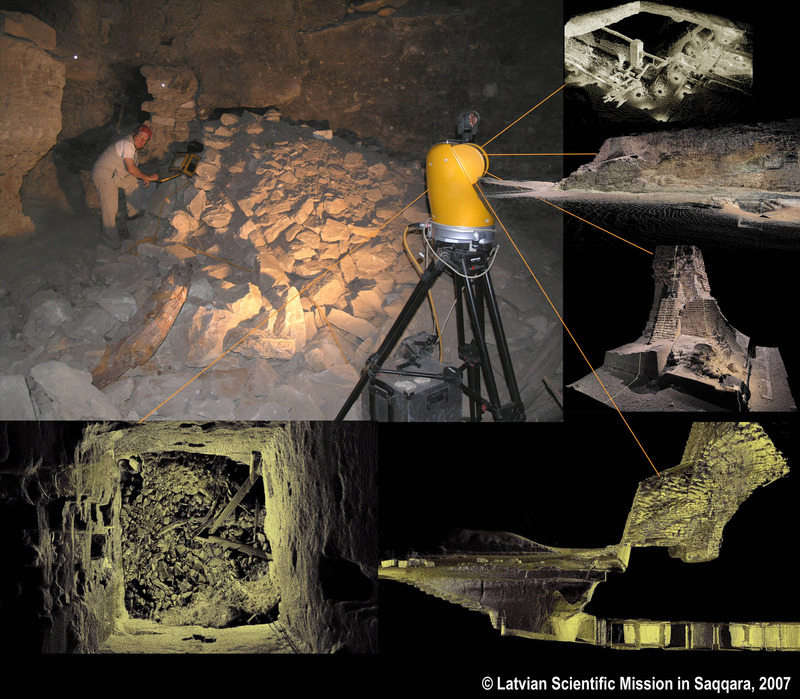 How many more years, centuries or millennia are the magic spells in the tomb of of the first sage of human history, protecting his corpse and final abode from the wisdom, skill and luck of modern ages scientists? W.S. Smith, in: Cambridge Ancient History vol. I/2, (3rd edition) 1971, 145ff. and, more generally, the chapters in the syntheses of Gardiner (1961), Drioton-Vandier (1962), Vercoutter (1992, p. 245-263). Thanks to Dr. Bruno Deslandes [head of the Latvian Scientific Mission in Egypt] for these 2 images.